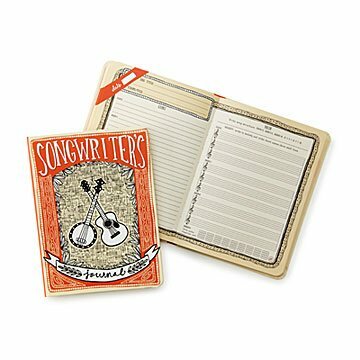 This unique journal helps musicians keep their lyrics and melody notes in one place. Crumpled paper. A napkin. The inside of your arm. Write your song lyrics somewhere more… sophisticated (and beautiful). This unique musician's journal helps you harness your musical creativity with spaces for lyrics, melody notes, and instructions. There's also room to define the "feel" and tempo of your latest tune. Give the journal to your favorite musician so that when inspiration hits they can get their next big hit down on paper. Made in China. We wanted a journal for our daughter, who is learning the ukulele, and loving the choral classes at her middle school. We went in with a couple other families and purchased six more journals to donate to her school's choral teacher, who enthusiastically accepted them. He'll hand them out to students whom he feels would really benefit from them, to encourage their creativity and musical self-confidence! In a world that revolves around high tech products and services, this gift supports the growth of raw talent. The journal is light-weight, easy to identify in a stack of clothes, books, etc., and a great way for a musician to track maturity in one's own giftedness. I will buy many of these for my songwriter! Excellent layout and space for everything you need. My granddaughter used this book as soon as she received it! She loves the layout. It encourages her to write her ideas lyrically and with chords. I'm excited to hear what my brother will write in this beautiful journal! I know he will love it. I was very pleased with this journal, it made the perfect friend a very special gift. Perfect for my musical grandson. My grandson is a talented young musician who is making up some of his own songs and I think he will enjoy the ease of using this book.